1, Hotels, Malaysia, Restaurants - let's eat chic, Shopaholic abroad, Travel - bon voyage! 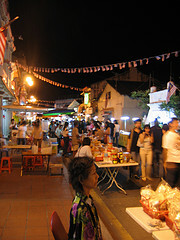 Melaka was livelier in the dark than she had been in the daylight. Once we’d bade farewell to Cedric, we walked across to Jonker Street, past the miniature windmill surrounded by a perfect bed of flowers that would look more appropriate in Disneyland. It was a very different place to the one we’d left that afternoon: stalls had been set up along the length of the street in front of the shops, selling everything you could possibly conceive, from terrapins to knock-off handbags, earrings to pewter souvenirs. It was time for some touristy retail therapy so my wallet came out. I was very proud of one purchase: a boxed model of the Petronas Towers which now lives on my desk at the Architects’ Offices. Priced at 18 Ringgit, I later saw its twin at the airport for a cool 80 Ringgit. Epicurienne loves a bargain, so this deal has gone down in her hall of fame. Then I picked up a handful of painted ceramic magnets. There was one of a couple in a rickshaw in front of Christ Church, so that had to be bought as a reminder of Cedric The Brave. Another of a Nyonya woman was destined for my soon-to-be Former Flatmate, whose fridge door is invisible beneath his magnet collection. Then our attention turned to a shop full of collapsible model junks. Monsieur admired the wooden masterpieces, and we chatted away about how little they cost (RM 180), but the bulk at this point of our journey would prove impractical and we didn’t know where we’d put it once home, so on the shelf they stayed. Further along Jonker Street, we found an emporium packed to the gunnels with inexpensive souvenirs. There I bought cellophane-wrapped packs of floral incense with ceramic burners and a sweet little daisy ties for friends back home. A few doors down, we gazed into a hall filled with middle-aged women practising line dancing. 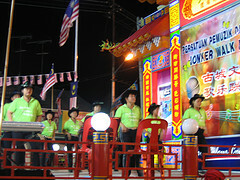 This seemed so incongruous at first – line dancing in Malaysia? – until we passed more halls of the same and a large outdoor stage where ‘Achy Breaky Heart’ was pumping out as line-dancing groups competed in country and western team uniforms, replete with cowboy hats. The crowd clapped along and cheered their favourites. Apparently line dancing is quite THE thing in Melaka. There were lots of stalls selling animals at he Night Market. We saw mice, hamsters and turtles, tarantulas, scorpions and even a pile of fluffy, sleeping pups. At a calligraphy stand I found Double Happiness signs for home, deemed a good luck charm by feng shui enthusiasts. Hopefully this would see the fates smiling happily on my future home with Monsieur. It was time to stop shopping. Monsieur was getting hungry and I had managed to fill my bag with gifts for almost everyone back home without destroying my budget. Our stomachs had now begun a noisy protest against the omnipresent signs that it was dinner time. Food was all around us and the locals were standing in groups gossiping as they ate plastic platefuls of delicious-smelling food. Everywhere we looked there were steamed dumplings, noodles in polystyrene containers, chicken rice and fast-moving chopsticks. It had been quite a day. In spite of the dinner gongs going off inside us, we were desperate to rest our heavy legs somewhere quiet, so we left the market behind in search of a sit-down restaurant and a bit of peace. This was not easy. Our guidebook proved unhelpful for the immediate area. There is no restaurant at the Hotel Puri, a neighbouring restaurant that had looked promising at lunch time was now closed for dinner, everywhere along Jonker Street was heaving and the only other place was too surreal. As we entered the latter option we noticed a large iguana asleep in a cage, an empty dancefloor and four bored staff who fell upon us with menus in case we might give them a purpose in life. Stale smoke hung in the air from previous evenings and there were no other patrons. Bad sign. This wouldn’t do at all. 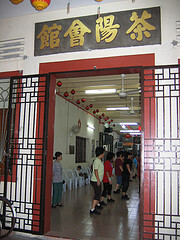 At the end of Jonker Street we took a cab to a Chinese restaurant at the Renaissance Hotel. “We haven’t made a reservation,” muttered Monsieur, “I wonder if they’re fully booked.” We needn’t have worried. As we walked through a lobby that screamed 5 star hotel, up to our second floor destination, the Long Feng Restaurant, we couldn’t have guessed that our prayers for calm would be so accurately answered. The dining room was certainly stunning. There were the requisite fish in a crystal clear aquarium at the door, starched white table cloths throughout, carved rosewood furniture and beautiful ink wash pictures on the walls. But there were no other patrons, and once more, there were four staff, just for us. The Rough Guide lauds Long Feng as providing “excellent Cantonese and Szechuan dishes in a classy setting.” As we settled at our table which could have seated six, the setting was certainly as they’d described. There was even a private banquet room with sliding doors off the main dining area and Chinese singers warbled away over the music system. The view from our window told a different story; across the street there was one of the dubious hotel frontages with crooked blinds and seedy entrance that we’d passed earlier on with Cedric. Nearby were massage parlours. Distracting us for a moment, our very pregnant waitress, dressed in a shapeless blue sack, brought us menus and delicious jasmine tea. Thirsty enough to drink a lake dry at this point, we swiftly moved on to beer and water. The food, however, was not to please our Western tastebuds. Everything we chose looked wonderful, but when we started eating, there was an all-pervasive greasiness that we weren’t used to. Monsieur’s duck had been cross sectioned to include marrow in the bone. We’d never seen it done like that before, although apparently duck marrow appeals in this part of the world. My chicken smelled divine but consisted of more fat than meat, so most of that went untouched. What a waste. I felt so guilty that we couldn’t finish what must be considered a feast by so many in this town. The rice and Chinese vegetables were simple and tasty, however, and kept us going, but we left hungry. Already feeling bad about the leftovers at our table, I felt worse about our waitress. The poor girl had looked tired when we arrived but now she had turned grey and looked ready to collapse. She needed to get home and rest with someone else to wait on her, not expend all her energy on a mere two diners as she’d done tonight. Back at the hotel I found a benefit of staying at the Hotel Puri: they had the Travel and Leisure Channel. I watched a presenter called Jennifer Convey as she travelled around the “Coat d’Azewer” (Côte d’Azur), eating “kwassantes” (croissants) and referring repeatedly to the “absolutely breathtaking views”. She played with a puppet called August (presumably Auguste) in a marionnette shop, crooned in saccharine tones “that’s so CUTE!” or “that’s so sweeeeeeet”, talked about walking in “jar-deens” (jardins) and was generally annoying. However, it was wonderful to see our beloved France from a very different part of the world so I nodded off that night on a cloud of imagined Provençale lavender, to dream of poppy fields and the Dordogne. Simply great to read your accounts of Malaysia. I have been there, but only to Kuala Lumpur. I would love to see more of that country, and have met quite a few Malaysians living in the UK. Reading your blog is helping me to plan a list of places to visit when I finally get there, and make it beyond the capital. The Chinese love fatty foods. If you ever have Chinese guests for dinner always give then the fattiest meat. The Chinese always give the fattiest bits of meat to honoured guests because they think it’s the best part. No I’m not kidding. A little while back I had a dinner with guests with heritages from all over the place. I had barbequed a couple of ducks and it was interesting to watch the reactions of the diners when confronted with the fatty meat. The guy with the Egyptian background hardly touched it at all, the Anglo people ate the meat and left the fat whilst the Chinese ate the lot with great relish. Hi Carol, thanks so much for your lovely comment. Monsieur and I were in Malaysia just under 2 years ago and had such a wonderful time that I just had to get our experiences out of my moleskine and into this blog series. So pleased you’re enjoying it. We’re off to Langkawi in the next post. If you need any help planning your trip, do let me know. We didn’t have time to go everywhere we wanted, but we certainly know what we want to see when we go back! Soon after my visit I compiled a blog about Melaka. I don’t blame you for blogging about Melaka. It’s a fascinating place. Now I only wish we’d had more time there. I particularly enjoyed our trishaw ride with Cedric and the night market with line dancers everywhere. I’ve visited your site and it makes me want to jump on a flight and come back over! See you there again soon.